Annotated tree of the Henslow family. Biographical sketch of the Rev. John Stevens Henslow. This reprint from the Gardeners' Chronicle was prepared for private circulation. Jenyns, Rev. L., 1862. Memoir of the Rev. John Stevens Henslow. London. This is a substantion account of his life by his friend and brother-in-law. Wikipedia provides a more concise review of his life. 1818 : Linnean Society Elected as a fellow of the Linnean Society. 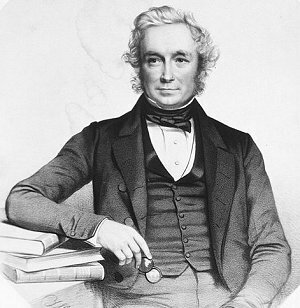 1819 : Geological Society Henslow was elected as a fellow of the Geological Society. CAMBRIDGE, Friday May 31 - UNIVERSITY INTELLIGENCE. On Wednesday last the Members of the Senate assembled to elect a Professor of Mineralogy, in the room of the late Dr. E.D. Clarke. J.S. Henslow, Esq. M.A. and the Rev. Francis Lunn, M.A. of St John's college, were nominated by the Heads of Houses. Before the scrutiny commenced, a protest was presented by two members of Senate against the node of election by nomination, and the Rev. Thomas Jephson, B.D. of St. John's college, was proposed as a third candidate. A large majority of the Members of Senate are understood to have tendered their votes for his election. At the termination of the poll the votes so tendered were not read over by the Proctor, and Mr. Henslow was declared duly elected. We understand that a great number of the Members of the Senate heve resolved to institute proceedings in one of the higher courts, for the purpose of obtaining a decision on this important question. 1823 : Publication A sylabus of a course of lectures on mineralogy. Cambridge. MARRIED. - On Tuesday last, (by the Rev. Leonard Jenyns,) J. S. Henslow, esq. M.A. of St. John's college, and Professor of Mineralogy in this university, to Harriet, second daughter of the Rev. Geo. Jenyns, of Bottisham Hall, in this county. CAMBRIDGE, June 24. The King has appointed the Rev. Professor Henslow, M.A. of St John's College, to the Regius Professorship of Botany, vacant by the death of Professor Martyn. 1835 : Publication The principles of descriptive and physiological botany. London. The King has been pleased to present the Reverend John Stevens Henslow, M.A. to the rectory of Hicham, in the county of Suffolk and diocese of Ely, the same being void by the death of the Reverend John Staverton Mathews. DEATHS. - HENSLOW. - On the 16th inst., at Hitcham Rectory, Suffolk, the Rev. J.S. Henslow, rector of Hitcham, and Professor of Botany in the University of Cambridge, aged 65.